To meet consumers’ demand for the future store requires the adoption of real-time, cloud-based technologies enabled by a powerful network. According to a new report from BRP, network bandwidth is becoming a bottleneck and applications are not performing efficiently. 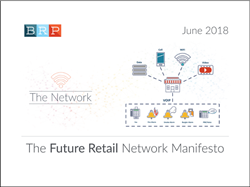 It has become so bad at some organizations, that retail store operations personnel refer to the network as the “not-work.” BRP published “The Future Retail Network Manifesto” to articulate its vision of the future store and identify the challenges and imperatives retailers face in delivering the expected customer experience. The network is a key enabler of the future store and most retail networks require a transformation to support the plethora of new applications that are putting a strain on bandwidth.